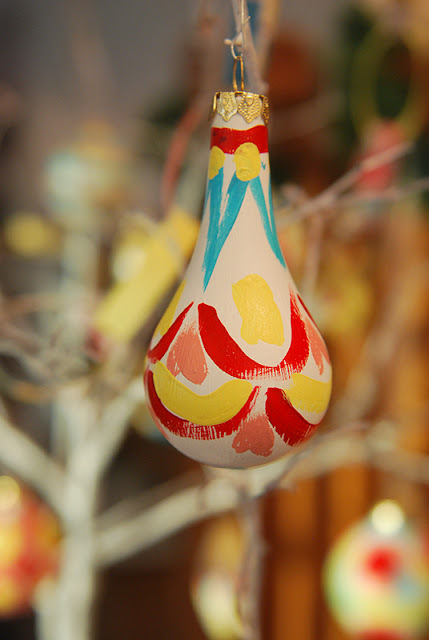 Hand-Painted Ornaments - Jill Ruth & Co. 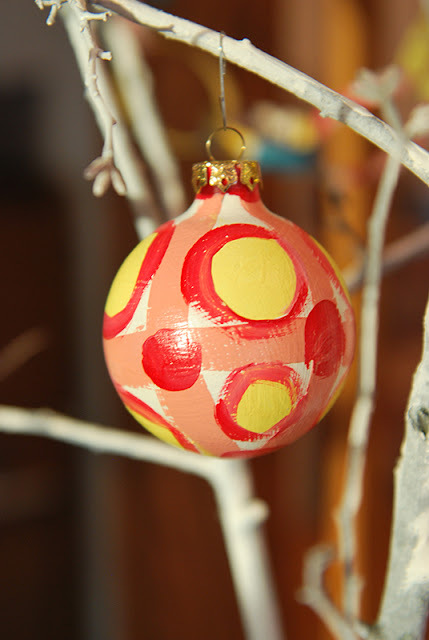 I saw some people posting pictures of hand-painted ornaments on Instagram and I was so eager to try it. 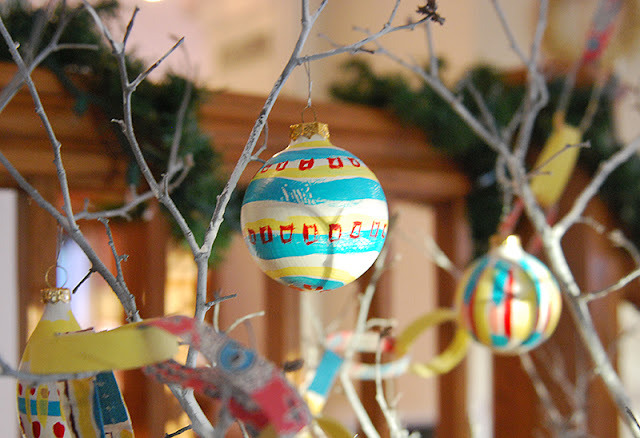 Especially, because I had clear ornaments on hand that I had purchased quite a few years ago to alter in some way. It was time to use those ornaments! I gave them all one to two coats of white paint first. I just used craft paint that I had on hand. 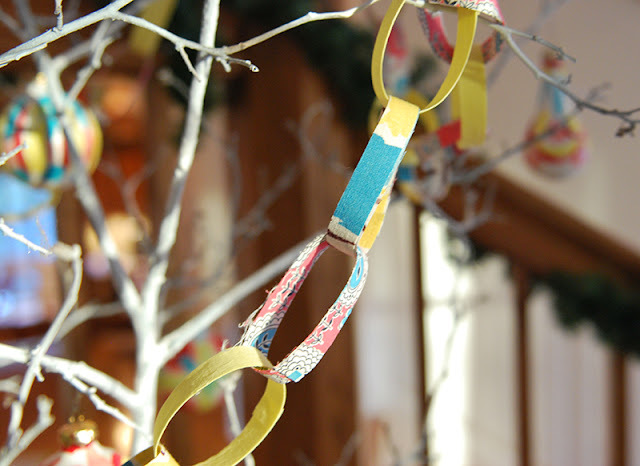 I chose colors that matched some favorite vintage fabrics I had so I could make a "paper" chain from the fabrics for the tree. I kept to four colors so all the ornaments would coordinate. After they were dry I gave them a coat of satin finishing spray. 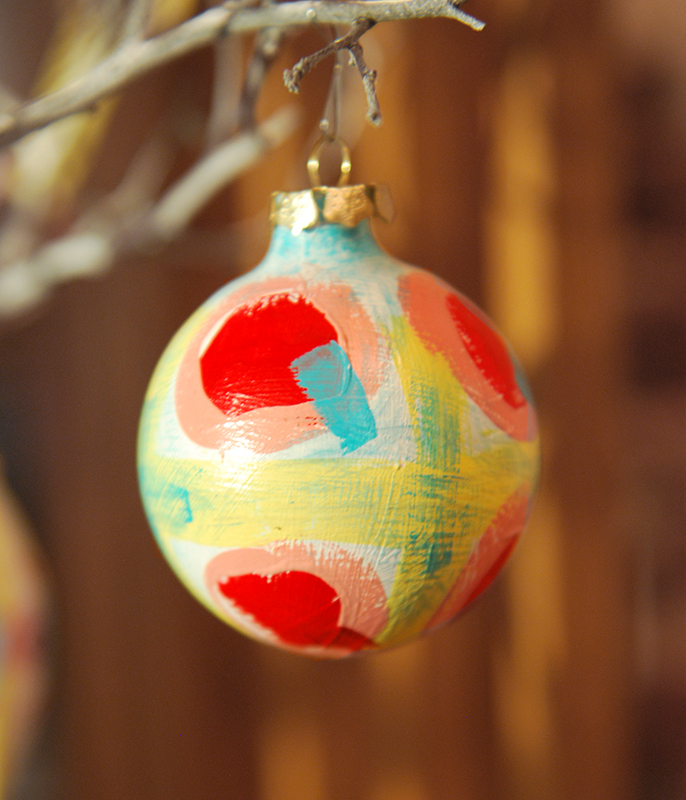 I have to say that enjoyed painting these as much as I enjoyed making my junk ornaments for my "Junk Tree". I watched this YouTube video before making the fabric chain. What I took away from her instructions was that you could use two layers of the heat and bond. I probably would have used just one layer on my own. I'm assuming that the two layers will give it strength and durability. 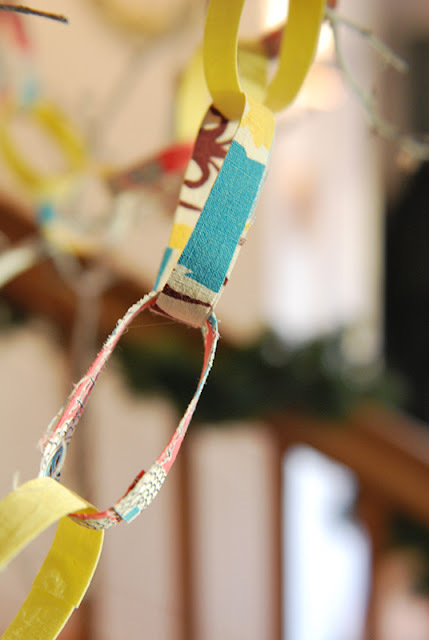 I made my strips 1/2" x 6" and used a drop of glue from a low temperature glue gun to hold the loops closed. I didn't want a thick and chunky chain, but a more delicate one for my branch tree I was going to use. 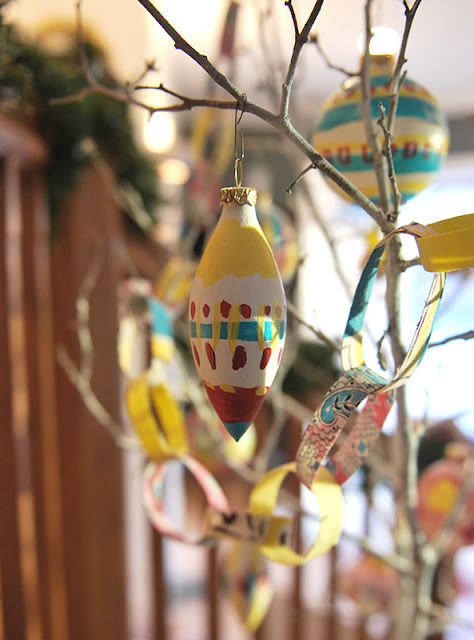 I thought these ornaments would look best on a white tree. Since a new white tree wasn't in the Christmas budget, I cut two branches (from sumac bushes) and spray painted them a light coat of white. I brushed on a little more white paint after I stuck them in foam in my galvanized pail. It really worked well. 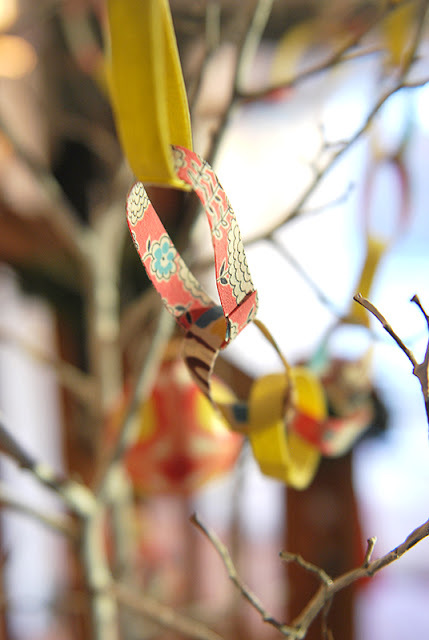 I'm planning on using these same branches for another Valentine's tree for Valentine's Day now after Christmas. I had two more... I tend to be clumsy....I stepped back into the sewing room to shut off a light and turned too quickly with all the ornaments mounted in a box drying and they spilled out. After I pouted, I realized that I needed to be grateful because six had fallen out, but only two broke. 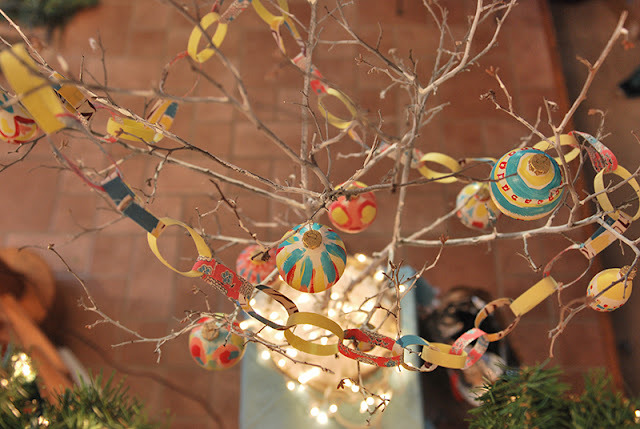 As we were pulling out decorations this year, I discovered that I have more clear ornaments! I should probably paint some more in the same color palette so I have back ups, ha! You are always so crafty. 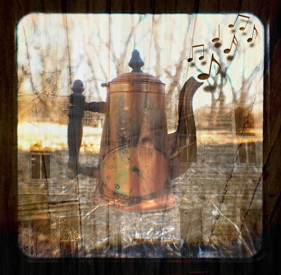 What precious treasures to create. You had fun AND made something beautiful... what could be better? these are great! 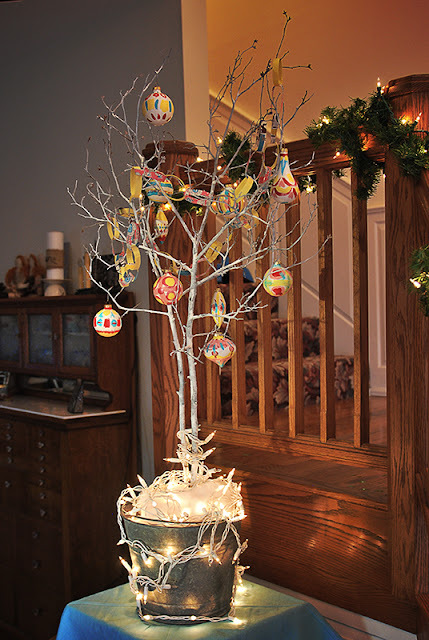 I love the color combinations - really stand out on the white branches - perfect junk tree!